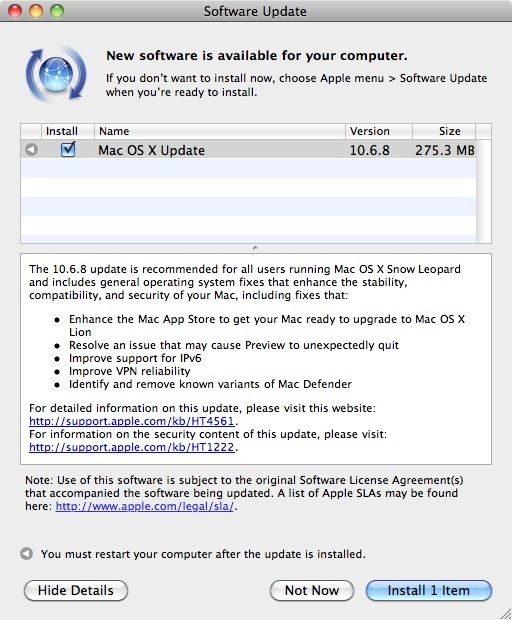 Mac OS X 10.6.8 is available now for all Mac OS X 10.6 Snow Leopard users. Aside from the usual bug fixes and enhancements, Mac OS X 10.6.8 is a requirement for upgrading to Mac OS X 10.7 Lion next month. 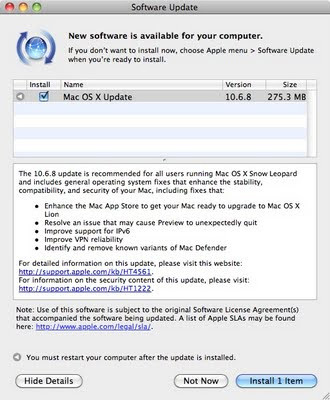 Use the Mac OS X Software Update control panel to download the update now. surprised you even have an apple product because they are more expensive than most computers,microsoft charges way more than apple to update their os. At the moment I don’t sense major commitment on the part of either the public or government to end the obesity epidemic. Given society’s unwillingness to address issues that threaten the survival of the human species – namely climate change and water and resource scarcity – it’s unrealistic to expect a major turn-around on government policies that threaten to cripple 1/3 to 1/2 of the US population with chronic, disabling health conditions.